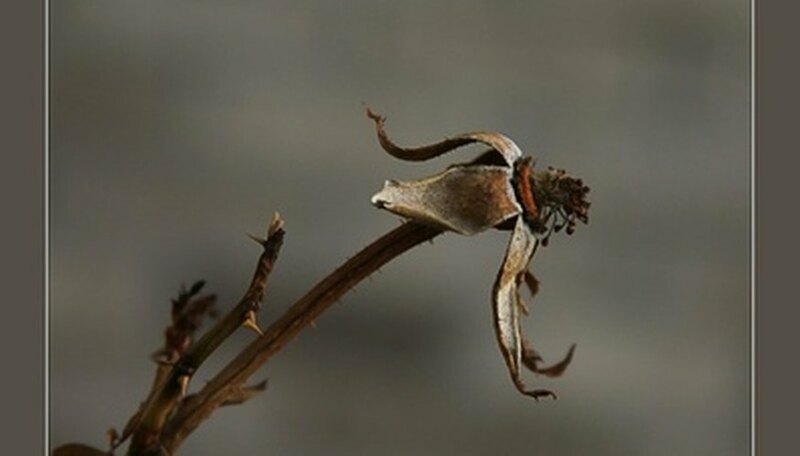 Plants eventually die--sometimes from disease, other times from harsh weather or neglect. Every plant has telltale signs of imminent death. When you observe these signs, it's time to stop trying drastic rejuvenation attempts and begin again with a new plant. You can determine whether your rose bush is dead, hibernating or just struggling by analyzing color, flexibility of the branches and looking for holes in the stems. Wait until the correct time of year to check the health of the rose. Rose bushes are deciduous, meaning they go dormant in the winter and will appear dead. If your rose bush looks dead, and it is early spring or winter, wait until late summer to evaluate. Prune off a branch from the rose bush and evaluate its interior color. If the branch is the color of wood, the rose bush is most likely dead. If the inside is green, the rose bush is still living and transporting nutrients. Look for leaves and leaf petioles. If there new leaf buds or leaves on the bush, it is alive. Look for pests and holes in the stems. If you see numerous holes and bugs living within the rose bush, then it is most likely dead. Bend a branch to check its flexibility. If the branch is stiff and perhaps even cracks, your rose bush is dead. If the branch is flexible, then the rose bush is most likely still alive.